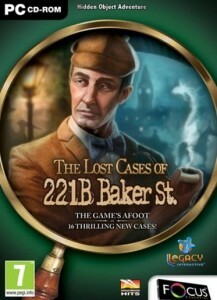 In this game you will join Sherlock Holmes and his friend Dr. Watson to solve puzzles. The game is a sequel to the classic hidden object game The Lost Cases of Sherlock Holmes, in this there is alot of game features that comes from the stories of Holmes based in Victorian England. You could investigate hundreds of leads and potentially clues in the 16 cases of forgery, espionage, theft, murder and more. Sherlock Holmes was created by Arthur Conan Doyle and was first published as a book then went on to the movie screen and on later years it also have hit the gaming scene. and also what could be the return of the infamous Jack The Ripper. In this game you don´t have to solve the games yourself, you will team up whit the classic Holmes friends such as Inspector Lestrade,Sherlocks older brother Mycroft, Inspector Lestrade and many other investigators and personalities. There is also alot of people in the victims and suspects, suchas archaeologists, smugglers, murderers, damsels in distress They even meet the famous H. G. Wells! The game contains 16 thrilling cases that needs to be explored and they all have bizarre circumstances and scenarios, that only the great Sherlock Holmes would be able to solve. The bad thing whit the game is that the player dosen´t have enought time to get fully involved and rembering whats happened in the cases. In all, the game The lost cases of 221B Baker Street is a good game in the world created by Sir Arthur Conan Doyle and the Victorian England. The gameplay is very detailed and the stories are strong and keeps the player intrested and hooked for the entire game. And whit 16 cases in one game, what is there to complain about?